The American Registry for Diagnostic Medical Sonography® (ARDMS®) administers examinations and awards credentials in areas of ultrasound. Through its mission, ARDMS empowers sonographers to provide exceptional patient care through rigorous assessments and continual learning. Inteleos is the non-profit governance and management organization for ARDMS and its companion Council the Alliance for Physician Certifications & Advancement (APCA). Our credentials have been awarded to over 90,000 medical professionals worldwide and are recognized as the international standard in sonography credentialing. CCI is an independent not-for-profit corporation established for the purpose of administering credentialing examinations as an independent credentialing agency. CCI began credentialing cardiovascular professionals in 1968. CCI's mission is To be an innovative, cost-effective organization, driven by professional ethics and integrity, through the representation of the profession(s) in providing recognized high quality, competency-based examinations. Radimaging skills LLC offers several products for ultrasound educators including INTERACTIVE ultrasound consoles clinical preceptor training modules! The modules are designed to help imaging professionals and clinical instructors bridge the gap between the role of "diagnostician" and "educator". Modules are available for both RADIOGRAPHY and SONOGRAPHY professionals! This module contains information on how to identify different learning styles, effective teaching and communication techniques, and conflict resolution. It is a QUICK and comprehensive program that clinical instructors can complete on their own time or can be presented in a group setting. Effective clinical education is key to a positive learning experience! A post-test, certificate of completion and 1 cme are also available! The Joint Review Committee on Education in Diagnostic Medical Sonography (JRC-DMS) is a nonprofit organization in existence to establish, maintain and promote quality standards for educational programs in Diagnostic Medical Sonography (DMS). Since 1983, the organization has provided a mechanism of committee review to recognize educational programs throughout the United States that instruct students in the disciplines related to DMS through education consistent with standards for entry into practice. The mission of the JRC-DMS is to ensure quality sonography education that serves the public. The JRC-DMS is a member of the Commission on Accreditation of Allied Health Education Programs (CAAHEP), the largest programmatic accreditor in the health sciences field. CAAHEP assures oversight and due process to all programs that participate in its system of accreditation. Gulfcoast Ultrasound Institute is the most comprehensive resource for live and online diagnostic ultrasound training and CME. Since 1985, our facility has been dedicated to providing the highest quality continuing education and skills training in the diagnostic ultrasound profession. We offer over 400 active ultrasound training products any way you want them! Gulfcoast Ultrasound Institute also offers blended ultrasound training, combining our comprehensive online classroom programs with live hands-on scanning workshops. We use the latest technology and innovative teaching methods to ensure our participants receive the maximum educational benefit from our courses. Gulfcoast Ultrasound Institute also receives consistent high ratings for the quality and amount of hands-on instruction…a key component to effective learning. The American Institute of Ultrasound in Medicine (AIUM) is a multidisciplinary association dedicated to advancing the use of ultrasound in medicine through professional and public education, research, development of guidelines, and accreditation. The AIUM’s membership consists of more than 10,000 sonographers, physicians, scientists, engineers, other health care providers, manufacturers of ultrasound equipment, and students. 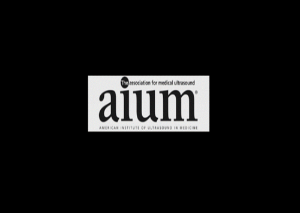 The AIUM is directed by a Board of governors and Executive Committee who are assisted by committees and a Council on Sections, representing many ultrasound specialties. The AIUM's official journal is the Journal of Ultrasound in Medicine. Ultrasound skills was developed to help the imaging professional improve ultrasound images. Sonography educators may use these consoles in a classroom setting to help students prepare for registries with console-like questions. Try using Ultrasound skills as a quiz or to simply to revisit basic optimization techniques. sonography or medical students may use ultrasound skills to improve point of care of FAST ultrasound exams. It is also available to use on most smartphones (with Microsoft PowerPoint) !